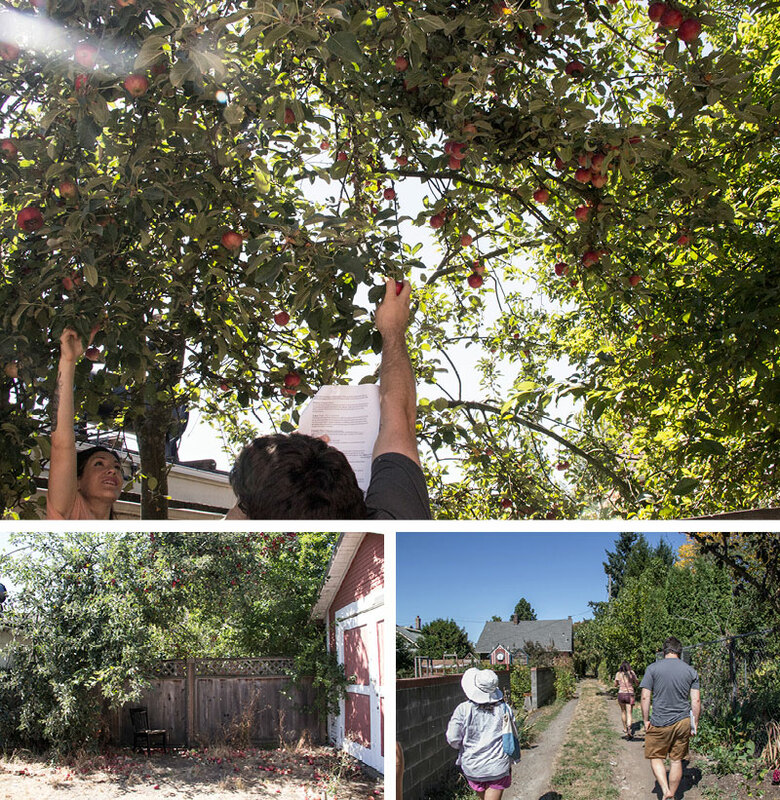 We immediately came across an apple tree with lots of fresh fruit. Becky informed us that her general rule is; if it hangs over into public areas, you can forage from the public side. 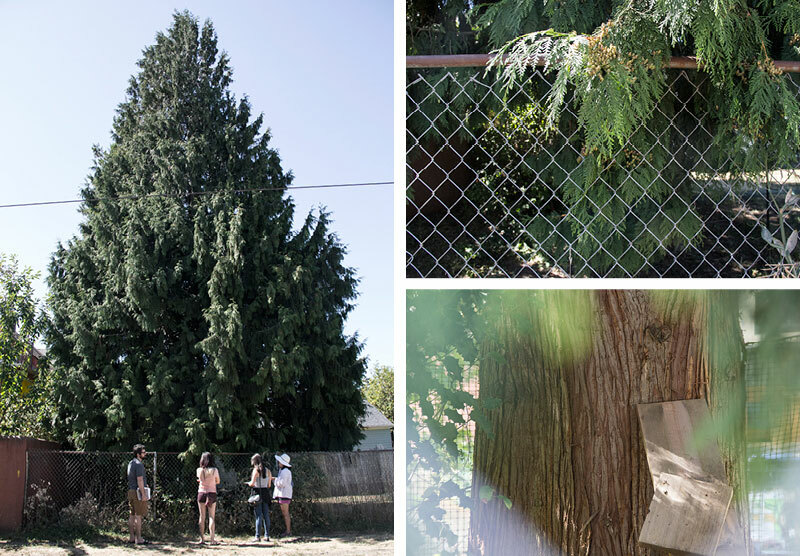 Western Red Cedar: edible needles, often used medicinally. Hops: Flower is edible. Used as stability agent and flavoring in beer. Mimosa Flower: sweet tasting, wilts quickly. We would love to use this as an ingredient, but it appeared as if it would last less than 5 minutes from plucking to plate. Maybe if there was an outdoor restaurant with a Mimosa tree in the courtyard? Kousa Dogwood: edible fruit – when ripe, these spiky red lollipops are sweet like mangoes! They are currently all over Portland. Here is an example of where we walked. 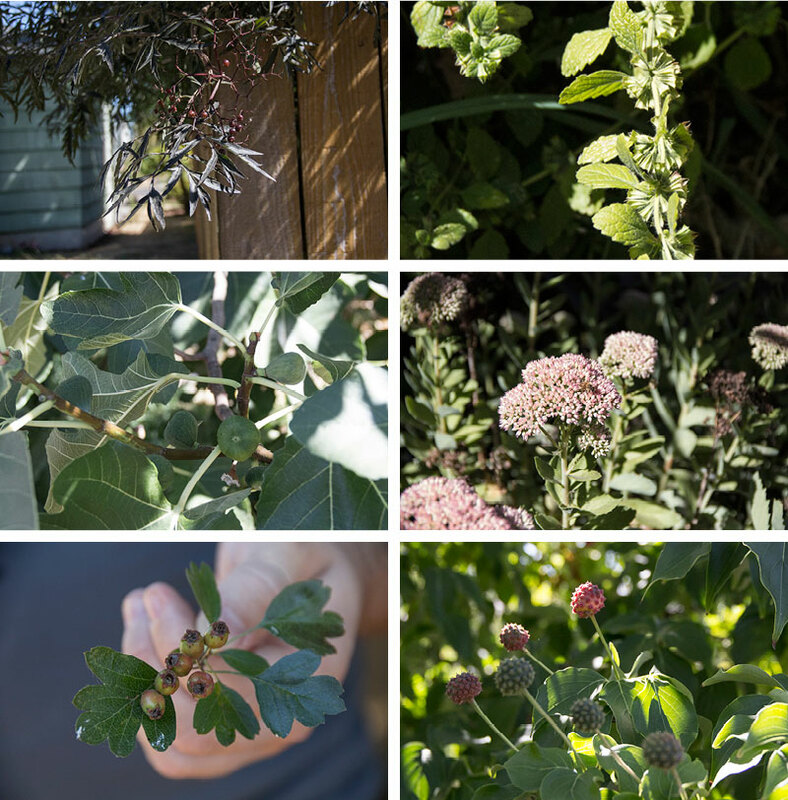 In a small alleyway just off of Alberta, Becky showed us at least four different edibles sprouting up as weeds all over the place. Happy foragers around the yucca plant at the end of the tour. Thanks to Heather K. Julius for arranging it for us, and Becky Lerner for sharing all of her knowledge. 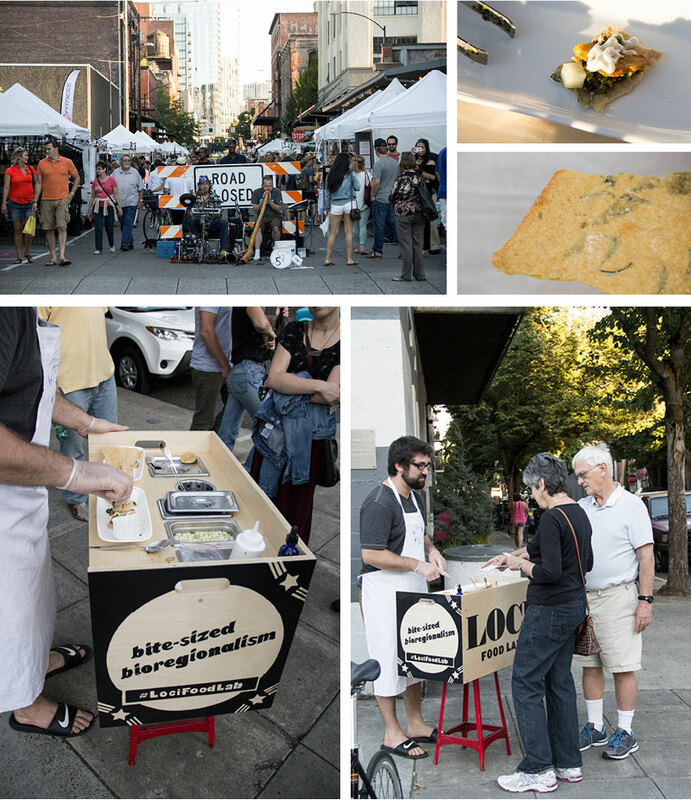 For the very first deployment of the LOCI food lab, we set up at the First Thursday street side event in Portland, Oregon. It was very exciting to feed about 100 people in the space of 2.5 hours. The majority of our eaters seemed to be intrigued that they were being fed by artists, and were very interested that their own bite-sized bioregionalism was being “plated” in front of them. With 6 components, the plating was a performance similar to what you see at a Chaat stand in India, one of our main sources of inspiration for this project. In future iterations I would like to continue to play up the performance of plating, both because it communicates a generosity and attention to detail that we think the future of food needs more of, but also because it speaks to the goal of “bioregional food research in public and in the street,” or as it has also been termed “NOMA for the people”. At least 1/3 of the visitors to the stand were not from Portland arriving from Massachusetts, Florida and South Africa. Only one visitor did not like the flavor of the food, the majority smiled and said they enjoyed the experience, and about 25% of visitors seemed truly moved by a novel flavor experience. 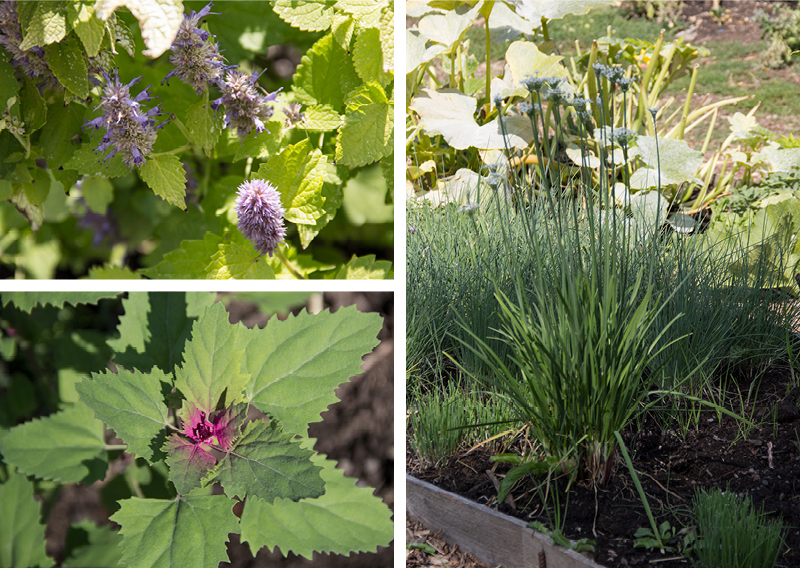 A few visitors gave suggestions for other possible bioregional or seasonal ingredients including: blackberries, hops and chanterelle mushrooms. For a first round of research and experimentation, we were happy with the ingredients and the overall dish, but I think we want to continue to push ourselves beyond the ingredients and flavors that are already ubiquitous in “Pacific Northwest Cuisine”. This is easier said than done, because seasonal and bioregional eating, and real time culinary research are already pretty well represented in Portland. As we take this project to other geographies and food cultures, it is likely that we will need to leave more time for research and experimentation. 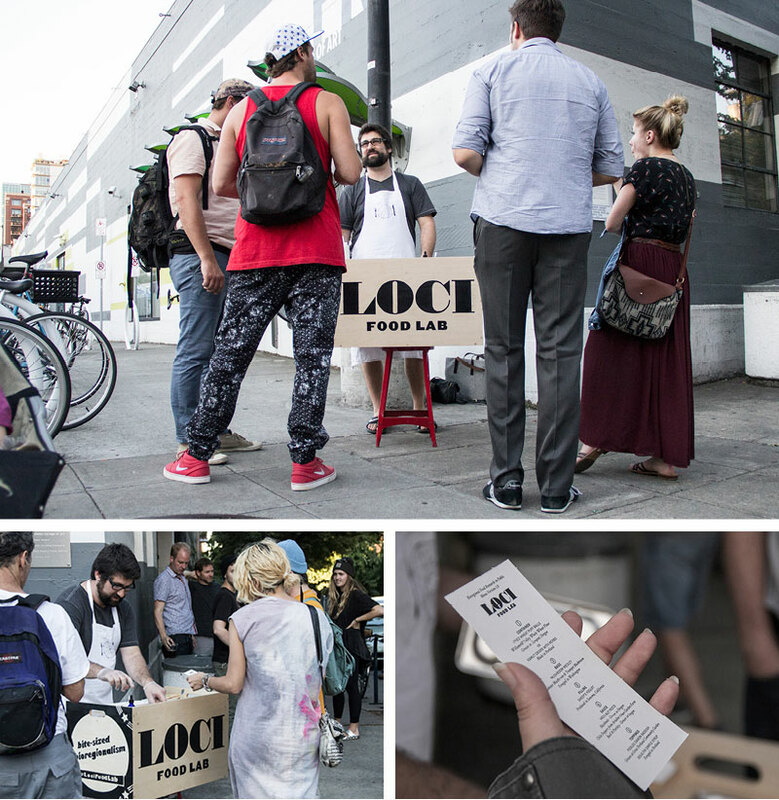 What is LOCI FOOD LAB? A framework for investigating the past, present and future of bioregional cuisine, and sharing these discoveries with a large audience at street level. 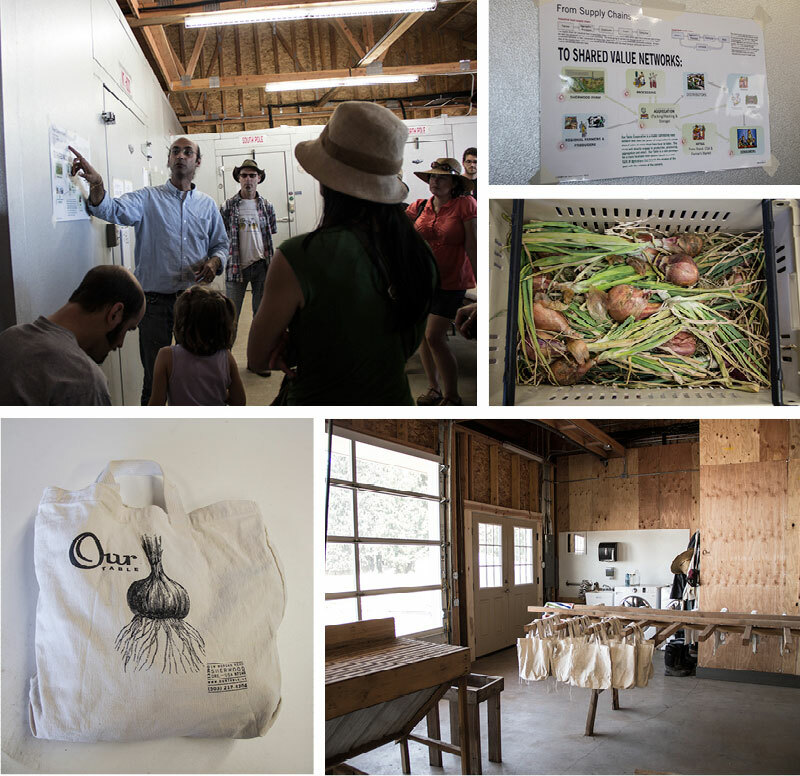 Last weekend in Portland, Oregon, we went on a farm tour as research for our upcoming project Loci Food Lab. We were told about the event and attended it with Heather Julius, our long time collaborator. During the tour we visited four sites ranging in size from 1/4 acre to 58 acres. 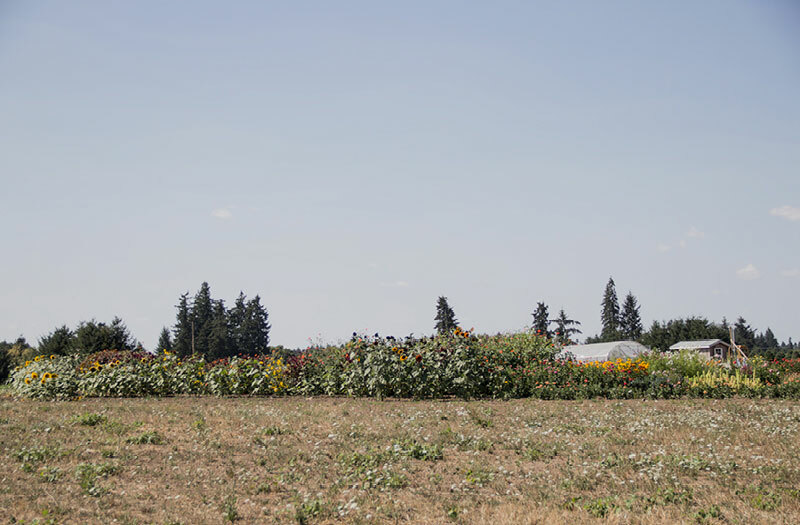 In preparation for Loci Food Lab, we are exploring bioregional ingredients in the Willamette Valley and the Pacific Northwest of the US, but also asking the question – what is bioregional? We will post more on that later, but for now, here is a summary of our field trip. 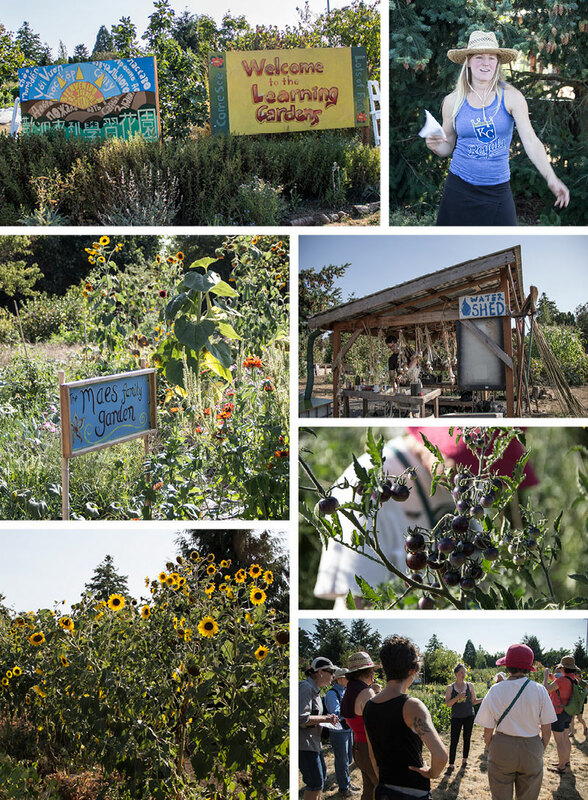 The first stop we made was Grow Portland‘s Neighborhoods Community Garden at 835 SE 162nd Ave. Some of the space was sub-divided into allotments that individuals can rent on an annual basis, while the area we visited was a community farm managed by our host Christopher. With a focus on food security, the farm had a goal of growing bulk storage crops that can be stored and eaten well after the end of the growing season. Storage crops are difficult for individual families to grow on smaller plots. 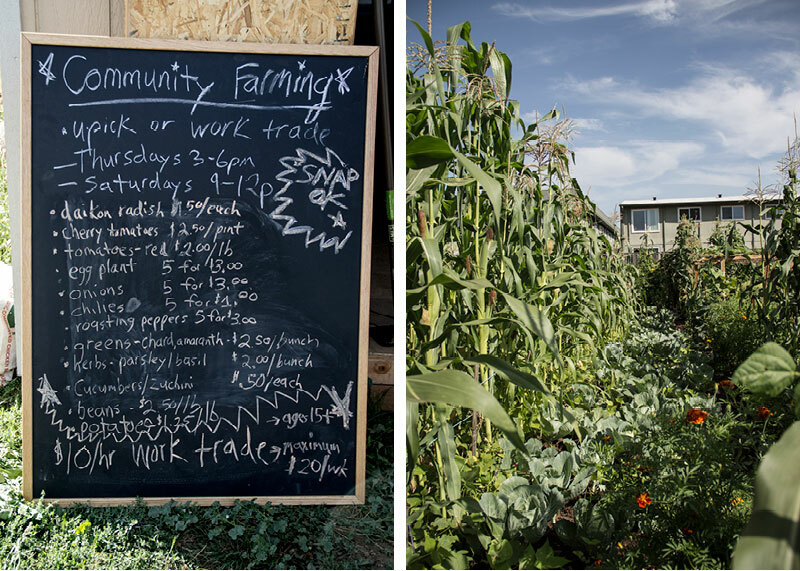 This project’s primary focus was food justice and community engagement, and it was experimenting with strategies to share the harvest. In addition to purchasing the harvest, there was a work/trade system in place where people could earn $10 worth of food for one hour of labor. One of the communities that Christopher grows with is a refugee population from Bhutan, who were forced out of Bhutan after the government instigated an ethnic cleansing. On the farm, they have requested to grow Daikon radishes, which they eat fermented. We purchased some at the farm for our test kitchen. Daikon radishes are crispy and delicious, and may serve as an ingredient in the loci food lab, representing the shifting agricultural trends of regions as populations of people travel across the globe and share their food cultures, of which American cuisine is a true testament to. Daikon radish is also useful for soil remediation due to it’s ability to de-compact the soil it is growing in. 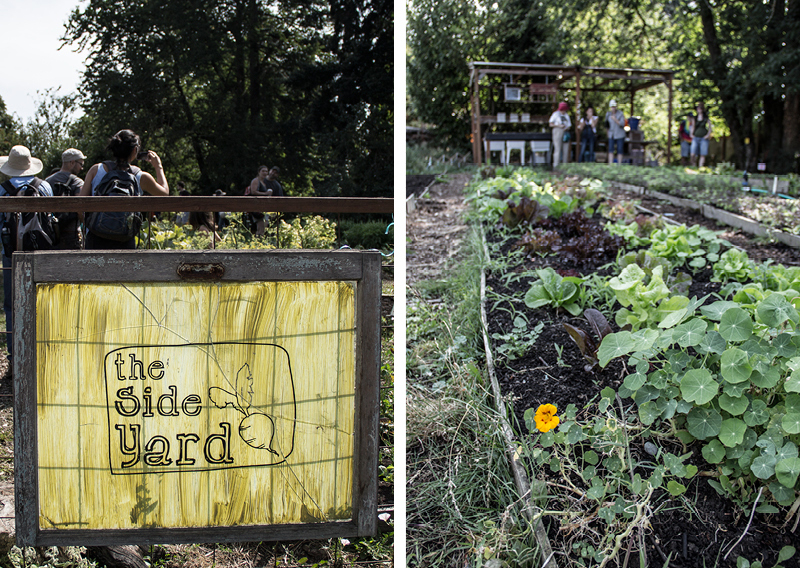 The Side Yard, founded by chef Stacey Givens, was our second stop on the tour. 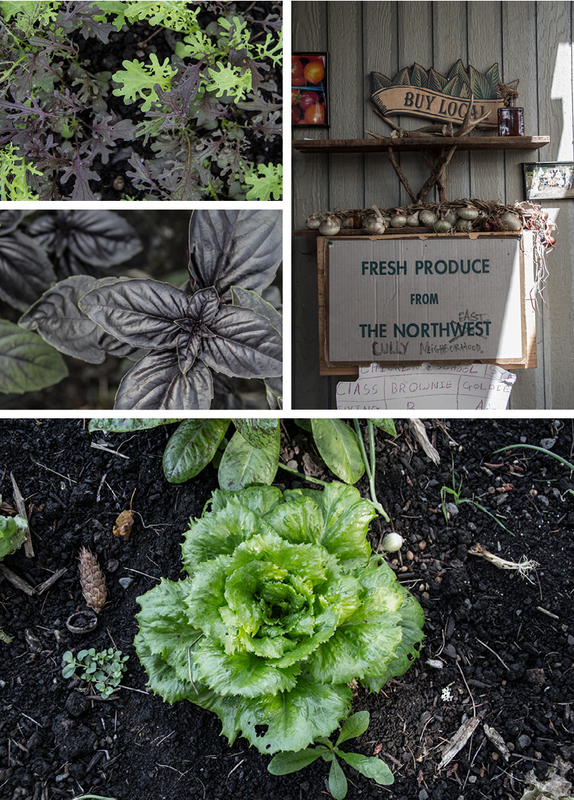 On just a 1/4 acre this urban farm grows hyper-local specialty crops for a handful of Portland restaurants. 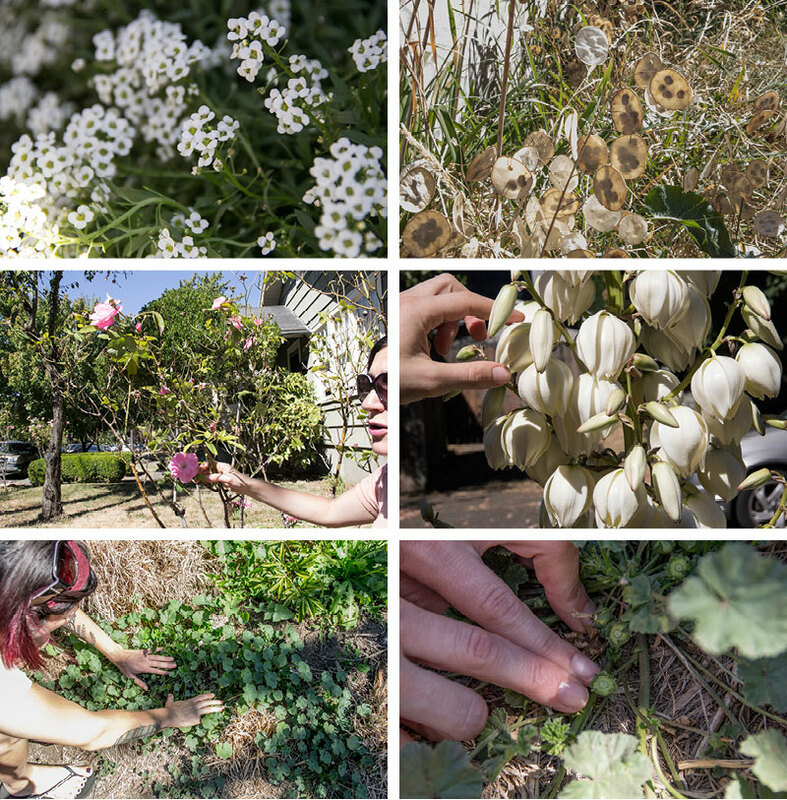 From edible flowers and micro veg to unusual varieties of herbs, The Side Yard has carved out a niche for itself in the Portland food scene. It seemed the community here was one of chefs and foodies concerned with sustainability and growing local, not only for ethical reasons, but also for novel flavor experiences. The Side Yard currently has 2 locations with a third opening in 2015. An interesting model of urban growing where space is at a premium. It makes sense to have a distributed network of smaller spaces rather than a single centralized space. When urban farming first became a fashionable contender in discussions about future food systems, one of the limitations I noticed in the utopian projects that I visited was that they grow basil really well, but weren’t about to provide all the nutritional sustenance for a community of any scale. However, as Bliss, the tour leader emphasized, sustainable farming practices should follow many models and be an “and also” equation, not an “either, or”. It’s important to encourage and support many approaches we observed on the tour, as they complement each other and in their diversity they fulfill different needs within the food system. Our Table was the third stop on the tour, and the closest thing to what you might imagine as a traditional farm. 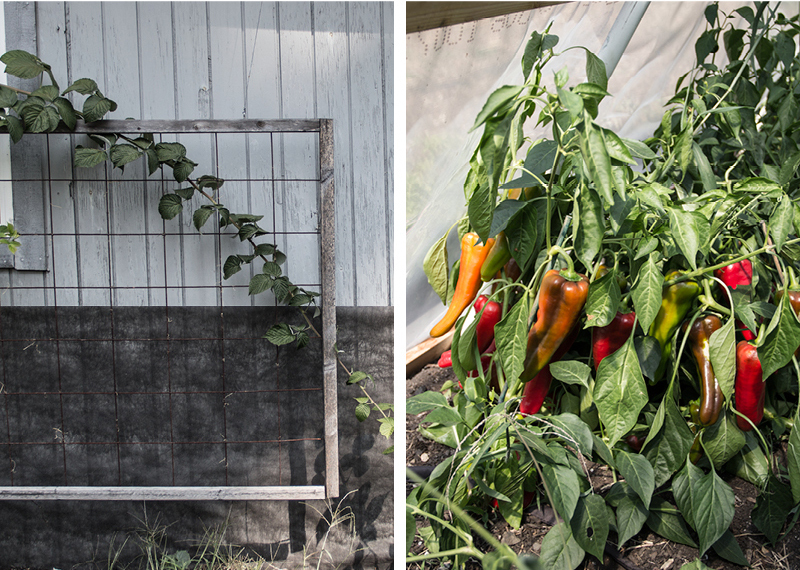 This farm is 12 acres and is a coop with a farm to plate mission. We were given a tour by the founder Narendra Varma who also explained in detail the philosophy behind the project. It was very idealistic, but also pragmatic, and very exciting to see such a well-managed experiment with an articulate leader. He explained how Our Table is building a model community food network, and as a cooperative they are trying to directly engage with the whole system from production, processing, aggregation to retail. 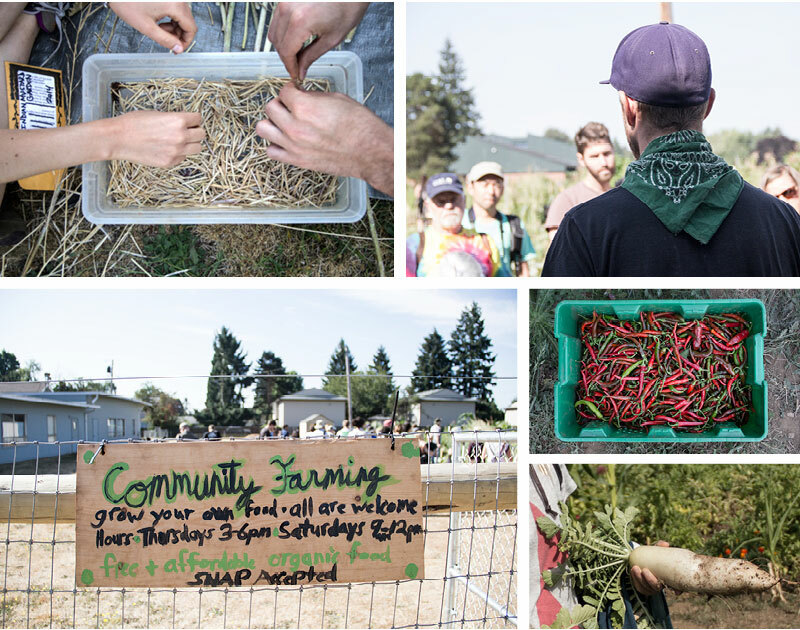 They distribute their crop to Portland through their CSA, which is designed to cater for single people, or urban couples who don’t always eat at home. They were also in the process of building a retail outlet on the farm, and offer u-pick for their blueberries and flowers. 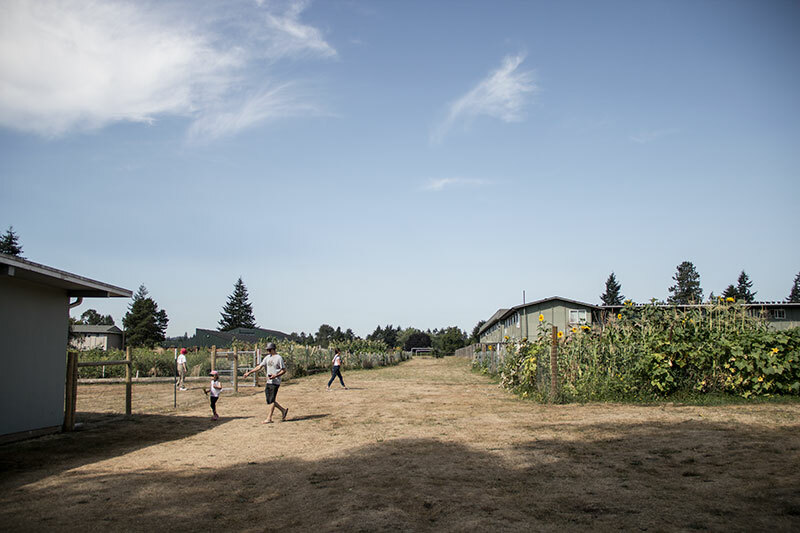 The farm is located just outside of Portland’s urban growth boundary. The land was purchased by Narendra’s family and became a land trust under a not-for-profit entity that rents the land to the Our Table Co-op. He was very supportive of renting farmland as a model, because often young farmers can’t afford expensive farm land, and a rental model makes more sense financially. He even suggested that cooperatively people could get together and purchase large areas of land at the urban growth boundary and lease it all to young farmers. The ambition for this model to scale and be adopted by others was apparent. Our Table is pioneering building a new food system in a very experimental, yet professional and pragmatic way, and I’m excited to see how it will evolve and inspire others over time. 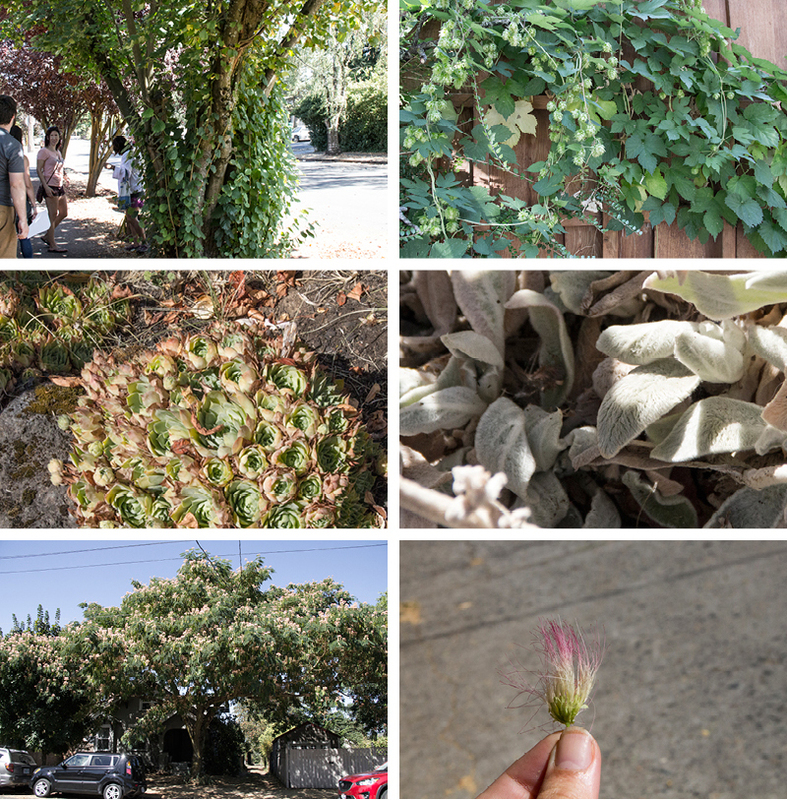 The last site we visited was the Learning Garden’s Laboratory in the Brentwood-Darlington neighborhood SE Portland. These 12 acres belongs to parks and rec, and a number of organizations seems to collaborate in running the site. On our tour we were told about three of the programs currently active on the site. 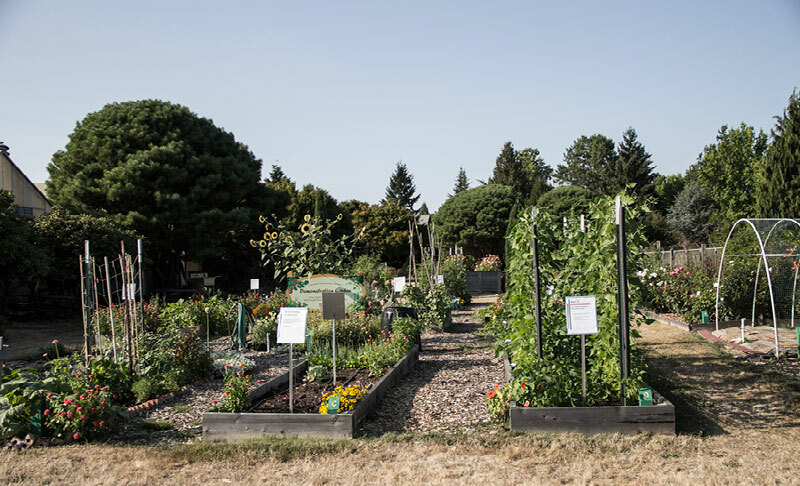 First, the Lane Family Gardens were allotments for families and guardians of lane middle school students, designed to support this largely working class and very diverse community. The second program was garden-based education for lane middle schoolers. 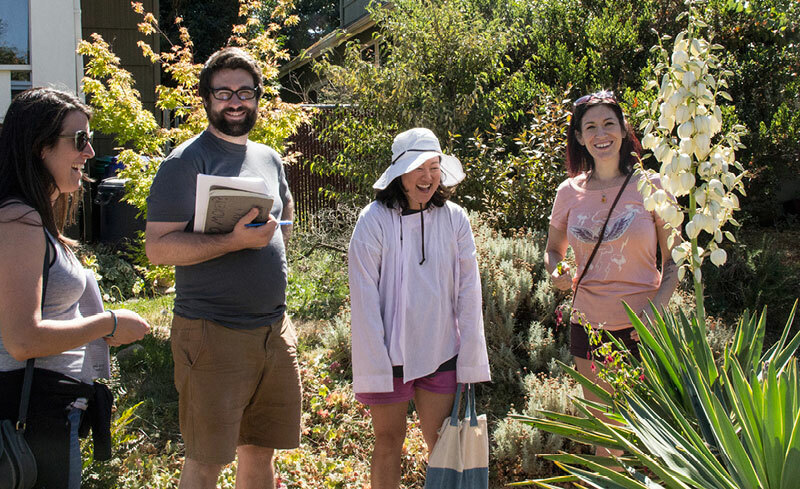 The students learn science, social studies and sustainability in the garden, and the classes are taught by graduate students of the Leadership for Sustainability Education course at PSU. 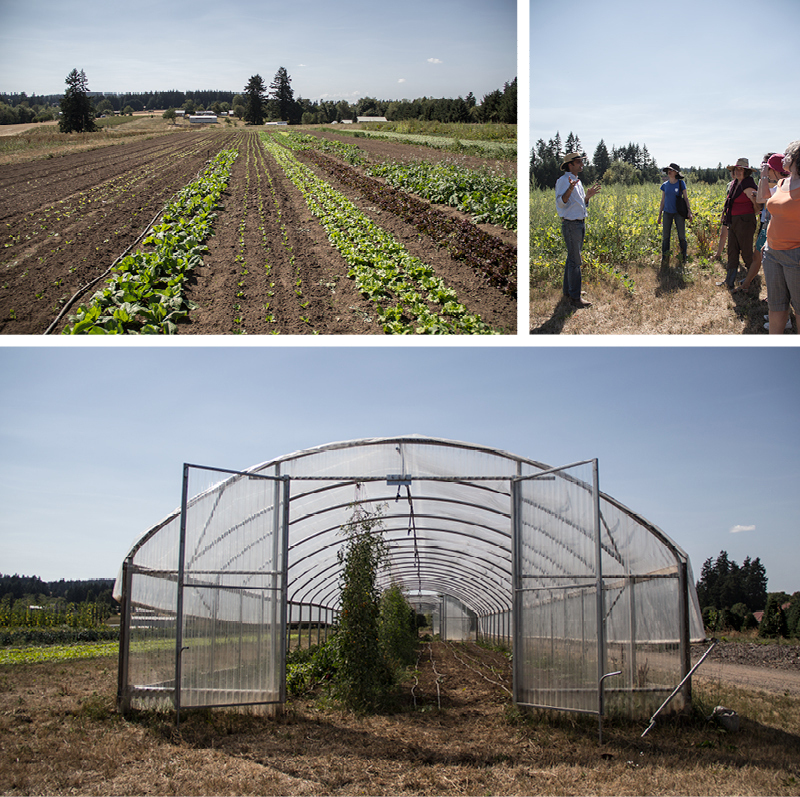 The third program was BUFA (Beginning Urban Farming Apprenticeship Program) run by instructors from OSU and Multnomah County. This sounded like an exciting program, where students were taught practical sustainable farming techniques and business development, enabling graduates to start a CSA or participate in any other farm or food-related small business. 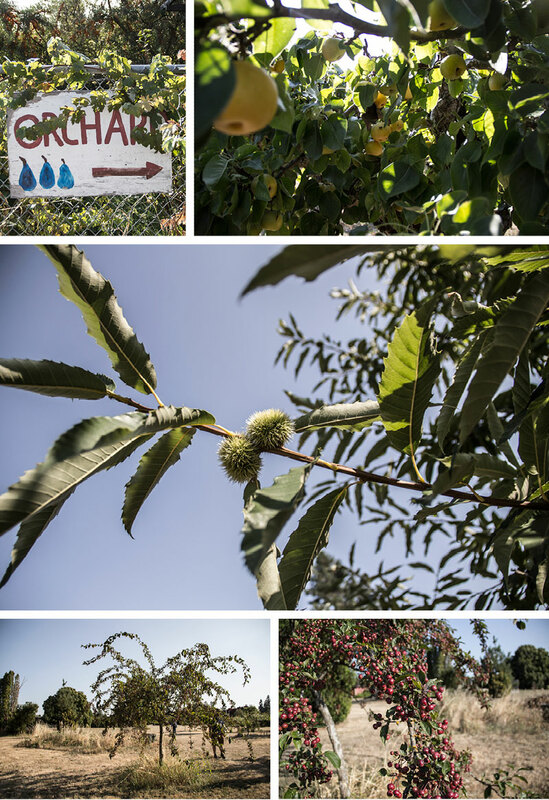 When given 30 minutes to explore the site, we also visited the Orchard and the OSU Master Gardener Demonstration Garden. 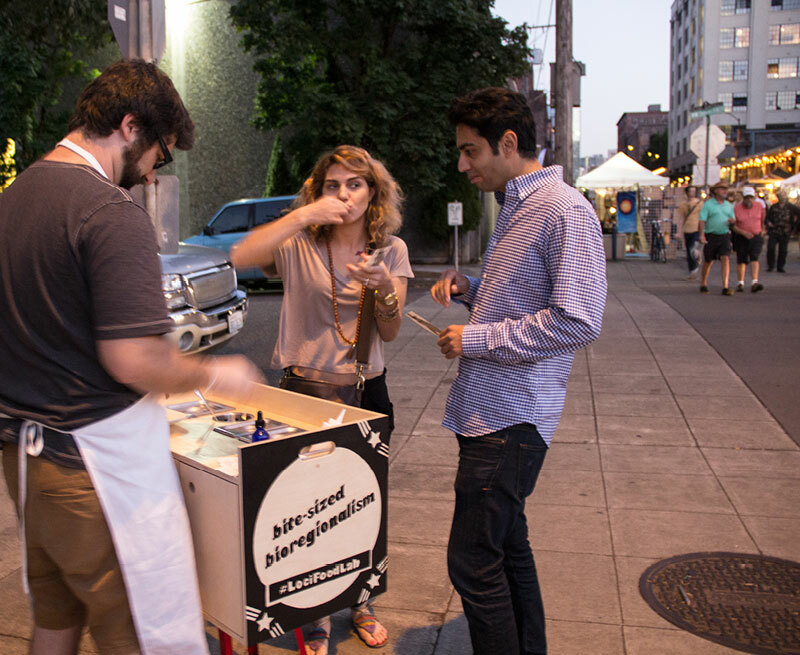 It’s exciting to be conducting this research in Portland, where food experiments and initiatives are so plentiful and prevalent. What we observed on this tour was just a small sliver of what’s going on in the city and along it’s perimeter. It’s an inspiring starting point for our Loci Food Lab tour. Next stop: eastern Scotland in the late autumn.